1.) My bestie left and moved to another state and I am sad, sad, but we did get some good quality time in before she left with a stay at Disney's Swan and Dolphin. Staying there had been on my Disney bucket list, because it had been one of my grandparent's favorite resorts, not to mention one of Disney's original hotels. Though now managed through Marriott, it was still a magical Disney evening! We dined, we lounged and we soaked up every last bit of fun together that we could! 2.) Next weekend we head towards the Florida Panhandle for a stay at Torreya State Park. We had originally planned it for last weekend, when I didn't have to work Sunday, but had to switch to this weekend. We will have a little bit of a shorter window, as we will have to leave early on Sunday for me to make it back in time, but looking forward to journeying a little further from home. Any North Florida tips on things we should do? 3.) I have been reading Chasing Slow recently and y'all?! You NEED to read this. So, so good! I usually have a really hard time getting through anything non-fiction. I grab a devotional or inspirational, self-helpie book with the best of intentions, then I get maybe a couple pages in and can go no further. They just can't keep my interest. Chasing Slow though?! Totally different story. Maybe it's because I feel like she is speaking my kind of language; speaking about a found love for less, talking to my heart about the letting go of the fast, rat-raced "American Dream" for a slower, life-lived journey. Maybe it's her story-like, laid back writing style, but whatever it is, I can't get enough. If you find me quoting strange things soon, that's what it's from... "The thing about the American dream, about marital bliss, about any rewarding pursuit in this world, is this: it isn't a given. It's a gift. When you forget this, when you forget to handle this gift with care, you will see that the American dream isn't a dream at all. It is a nightmare, and you have been thrashing through it, your twisted sheets a noose. And you question whether you can live with the snooze button." "We are young and a little dumb. Mostly, we are just young enough to think we aren't dumb at all." "Sometimes the most holy thing we can do is to be still. To sit down and twirl the fork and eat the pasta we're given." Seriously you guys?! 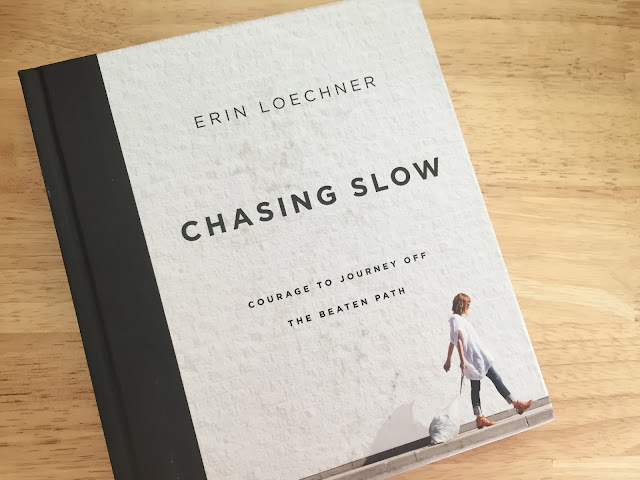 This book (on sale on Amazon right now) is a must for any of those looking to slow down and wondering if less really is more... spoiler alert: it is!! 4.) I tried Bulletproof coffee recently and let me just say, "game changer!" I started with just the basics: grass-fed butter, coconut oil and added a little creamer and almond milk, then blended it all up. Amazing, frothy goodness!!! It really did seem to help with my mental clarity and held me off until lunch. I now add a little bit of protein powder (just a smidge) and I "bit the bullet" (pun totally intended) and bought the official Bulletproof coffee Brain Octane Oil. I will let you know if I find it to be any more "powerful" than regular Publix coconut oil. 5.) Because it's Friday and because I am trying to be productive today and plan all our upcoming adventures and do all the things, I thought it was time for a little Sweet Journey Shop perk. You can head over to Etsy and use the code FINALLYFRIDAY for free shipping through Monday! Any fun plans for your weekend?! Let me say it again! I love Friday in all it's end of week glory!! Babe and I were originally heading off to the Florida panhandle today for a weekend of camping a little further away than usual, since I don't have to work this Sunday, but y'all plans changed, because big things are happening. My best friend is moving away!! Far, far away!! To another state, away from me and this is her last weekend here! So I will be spending every last drop of time I can with her. Plus it should be noted that she is making my Disney dreams come true and we will be having a girls night at the Swan and Dolphin and sending her away in style. 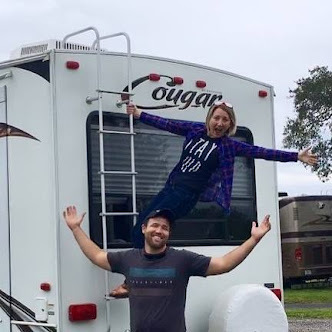 I am all kinds of excited for her and, given that I plan to visit her very soon after she moves, AND given that if I have anything to say about it we will be on the road, as full-time RVers, sooner rather than later, I am trying not to be so forlorn about her leaving. But given that the only time we have really ever spent apart was during our 4 (ok, 5) years of college this is going to take some adjusting, so to distract my little heart I figured it was time to share our most recent camping trip! A few weekends ago Babe and I actually took a camping trip of a much different caliber... camping with kids! We took my two nieces to Lazydays RV Resort, near Tampa, where we actually purchased Flo. They had given us two nights of free camping at their resort so we figured we would utilize it with the girls, since they have all the fun amenities like the pool and playground (and looking at RVs for sale)!! My youngest niece had been begging to take a trip in Flo (girl after my own heart) and so I told her we would take her and her girl cousin around her birthday. Y'all?! She was so stoked! Told everyone she could that she was doing that for her birthday, so the weekend before she turned 6 we loaded them up (with an early school release and all) and set out for big adventures!! While I would have been fine to have spent the weekend at a state park, enjoying hiking trails and nature at it's finest, it was actually really nice to be at Lazydays. With the site voucher it worked out well!! We got there midday Friday and spent the first hour or so exploring the RVs for sale over at the dealership (it's connected to the campground). Though this part had originally been for me, the girls LOVED it; going in and out of the RVs they wanted to see, hopping on and off the bunk beds! We then headed off to take a dip in the pool, which was really nice. It's screened in and heated, so the lingering April chill was nothing! Plus they had a hot tub for this tired Aunt Mel, not to mention an attached bar. I love the peace and quiet of a state park, but I could get use to hot tubs and margaritas!! Considering camping with kids is far louder than camping without them, it was definitely a nice treat!! This BBQ food truck was a great lunch option!! Adventure Island is AWESOME!! Seriously, I actually think I preferred it to any of the Disney water parks (and for this #DisneyFreak that's saying A LOT)! It was clean, well kept up and super great for kids and adults alike. We got there when the park opened and got a spot right away. It was really nice not having to fight over chairs! While the park did fill up around noon, we basically got on-and-off each slide for the first 2-3 hours. It was so much less crowded than the Disney parks (even once it seemed full) and it also didn't seem like such a trek just to get to the top of the slide. My favorite area (which is where had put our stuff originally) is right where you first walk in. There are 5 different slides, coming out of a waterfall structure, that all spill out into the same pool. The girls were able to go by themselves, if Babe and I wanted to take a minute to relax on the lounge chairs. The waterfall feature was really cool too! You can enter the slides through where the waterfall runs into the pool, making it feel like you are climbing a real waterfall. There were tons of other slides in the park- some newer and some my husband remembered from when he was a kid (his dad lives in the Tampa area)- so it was fun to get a mix of the original and more updated fun! I LOVED the toboggan ride they had! It was scary and full of fun for this adrenaline-loving heart of mine! I did it a handful of times, as I could not figure out how to skid all the way to the end without falling off. The last time (after coaching from Babe, "Lean forward all the way down, then lean back once you hit the water") I finally managed to stay on until I hit the end of the water. Mission accomplished!! One other super great perk of Adventure Island was that there were not many slides that both girls couldn't do; praise the Good Lord!! Makaylin (the youngest and birthday girl) was not too happy when she couldn't ride things her cousin could, but there were only about 2 slides she couldn't do. Some of the more intense slides simply required that the smaller kids either be with an adult or wear a life vest. If you have a kid (or ever take a kid) who loves to "do it all" you know what a relief this is!! She was able to do most of the things we all could do and we didn't have to worry as much about having her upset that she couldn't ride something. 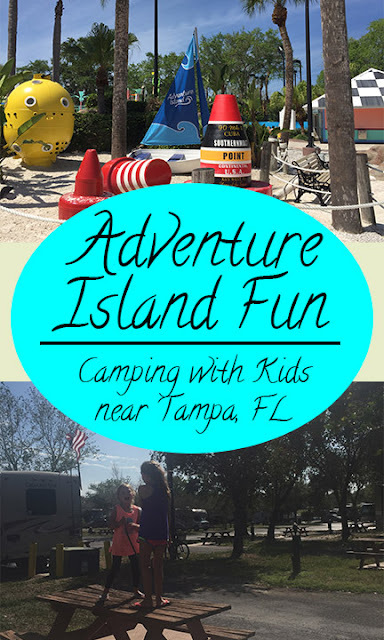 Adventure Island couldn't have been a better pick for our full day of fun on Saturday!! We shut the park down and headed back to the campground, where we actually spent even more time in our suits by taking another dip in the pool. While we made dinner the girls played Go-Fish and traipsed around the grounds. We then passed out in bed with tired bodies and happy hearts! Which was better than the first night, as we did have a little "snaffu" over the sleeping arrangements and one girl taking up too much room on the jack-knife-couch-turned-bed, so that we somehow all ended up in our not-completely-Queen-sized-bed during the first night. Given though how things can go when doing anything with kids I will say we came away pretty unscathed! she gets it naturally though y'all, it took me three years of marriage to stop sleeping sideways! Now just imagine that, for at least an hour, there was also an Uncle Andrew in here! He didn't last long obviously! Sunday morning we woke up and made a pancake breakfast and then the anxiously awaited moment arrived... the girls getting to help dump the tank! You guys?! The amount of wonderment built up inside those two little girls about the idea of all their poo sitting under Flo, and the fact they were going to get to watch it get flushed out, was something that I can't really even describe. The first night, they literally had their heads inside the toilet trying to see if they could figure out where it went and we took a flashlight-lit field trip outside to explore the undercarriage of the trailer so that they could see the tank all of "it" was sitting in. Thankfully each spot had it's own septic spot, so that we weren't holding up a line of rigs waiting to dump while the girls "oohed and ahhhed" over the whole mess- literally! (Side note: the sites were really nice. They were paved, which kept Flo cleaner given the amount of feet trekking through her, and came with a picnic table) We then, sadly, loaded up and headed home. It made my soul so excited to see them loving the outdoors and getting so pumped about all things RV life!! When they said, "we love Flo! We want to live in Flo!" I simply replied "me too girls, me too!!" Ever been camping with kids? Any fun stories to share? 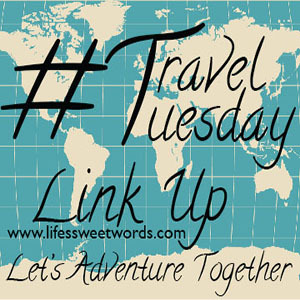 Super excited for another #TravelTuesday link up! I am actually sailing the high seas right now and procrastination was in full force, so I don't have anything new today, but here is a peek back through all previous cruising fun, should you wish to explore them. In the meantime, leave your adventures below so we can all get some travel inspiration. 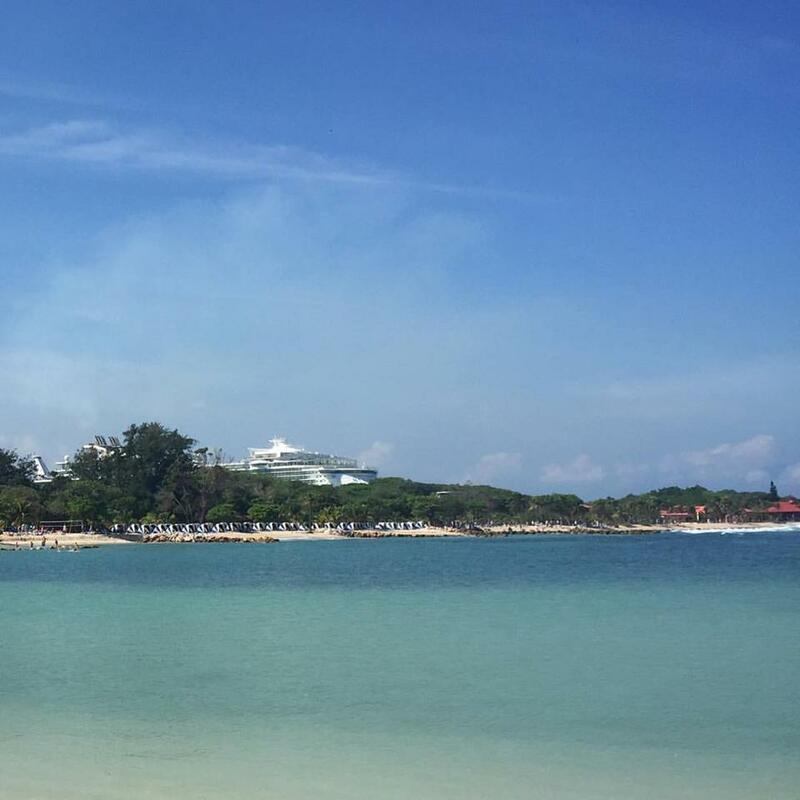 Carnival Breeze- This was actually probably one our our favorite cruises! We LOVED every port! Allure of the Seas- Our most recent adventure on the high seas and our first time with a balcony room! We definitely love to cruise! This week I am sailing sans Babe, but I do have my mom, sis and cousins in tow, for a Girl's Cruise Extravaganza!! My cousin has never cruised before and this was a retirement gift from her mom. I am super pumped to see what she thinks about life on the boat!! What adventures have you been up to? Try a new restaurant in your own backyard? Taken a day trip in your home state? Journeyed to far off lands? Link up below and let's travel together!! ~On the 2nd Tuesday of every month I will be sharing a new travel post and would love to see where you have been exploring! ~Any linked posts will be pinned under Travel Tuesday on my Pinterest account. ~Not many other rules, as I am not a huge fan of those sorts of things! Just add any travel related link and I encourage you to peek around and see where everyone else has been. ~I will also be sharing my favorite post from the month before. 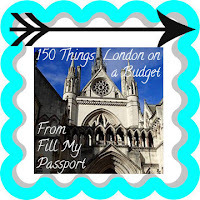 March's fave was from Fill My Passport, because her extensive list of 150 uncommon things to do in London was great for any future London travel plans of any budget! Hope your day is glorious!! ~Accomplishing~ All kinds of paperwork for my new job! It's a little scary and a little exciting, because it has the potential of getting us one step closer to full-time RV life!! ~Feeling~ Excited about the giveaway currently going on over on Instagram! 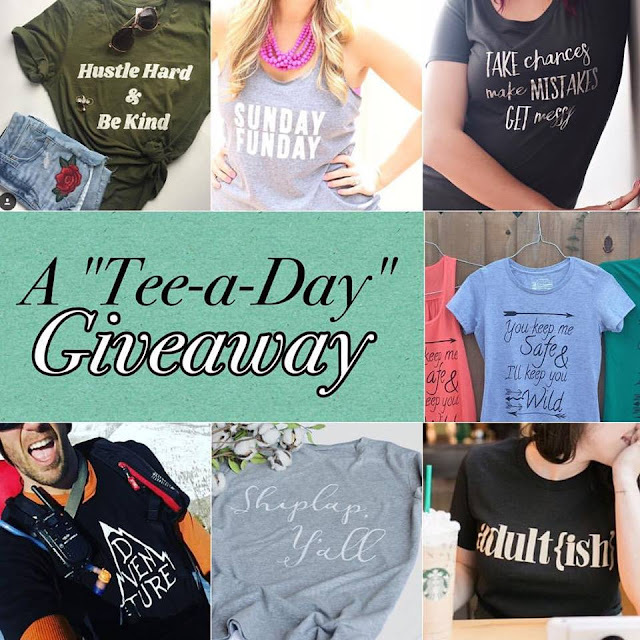 I am partnering with 6 other awesome shops for a "Tee-a-Day Giveaway"! One winner will win a graphic tee from each shop; one for everyday of the week. Head over and check it out if you want to join in! ~Needing~ To go clean the mess that is my kitchen! I hosted book club last night and we had a blast sipping wine and eating lasagna bites, but my kitchen it paying for it this morning. Lasagna is a messy meal prep! I think I used every bowl in the house. **Book shout out to Eight Hundred Grapes- such a good one y'all! Super quick, fun read!! Plus it has you wanting to sip all the vino and who doesn't love that!! ~Practicing~ How-to videos for the the new j-o-b! 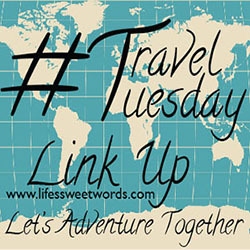 ~Pinning~ All the awesome travel spots over on my Travel Tuesday link up board. A new link up will go live on Tuesday for anyone who wants to join in and share some of their adventures. And that's it for April... for now! What is going on in your world currently? !